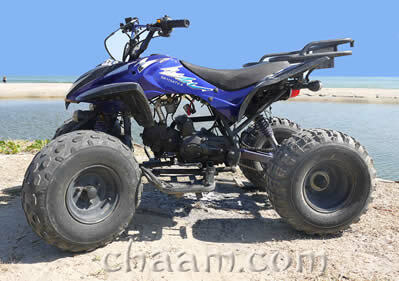 If you really want to have fun in driving in Cha-Am, then you can rent an ATV (Quad) to drive in the beach roads of Cha-Am! With 120 ccm the little runabouts are strong and easy to handle. There are only three gears to operate with: The forward gear, reverse and neutral gear. Otherwise it is just speed and brake. The ATVs are equipped with light so that you can also drive in the evening. In Cha-Am, there are many sandy and hilly roads, where it is a real pleasure to drive the ATVs. 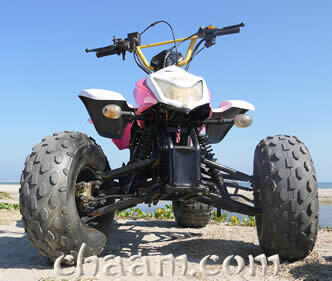 We have two models for rent for you, a blue ATV and one in pink. Thus, you can also drive around with your partner on two vehicles. Make a test drive and enjoy the ATVs! How can I rent an ATV? Very easy: Just send us on our >> Contact Form >> your datas (name, how to contact you) and the time period of renting.